As many head to their childhood homes for the Christmas holiday, there's a good chance you may stumble on some forgotten yet classic home accessory treasures in your parents' basement just begging to be rescued. If you're a child of the '80s or '90s, there's a distinct possibility that one of these magical findings may be a beaten and battered set of wooden bowls, a holdover from the '60s and '70s. These bowls were so popular in the '60s and '70s and have that classic retro look to them. Can't you just picture them sitting on the table with a pot of bubbling fondue nearby? Many swore by the use of wooden bowls to enhance the flavor of salad, and after use, abuse, and outright neglect, they were often tossed in a pile with other misfit dish ware, never to be seen or eaten off of again. But the thing about these bowls of a bygone era is that they just need a little bit of love to be revived. 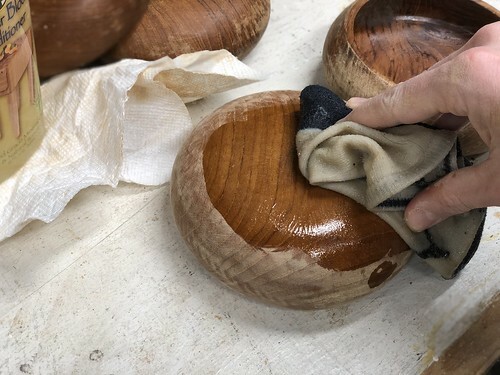 When a free set of wooden bowls in need of a little TLC presented themselves, Wendy could not pass up the opportunity. 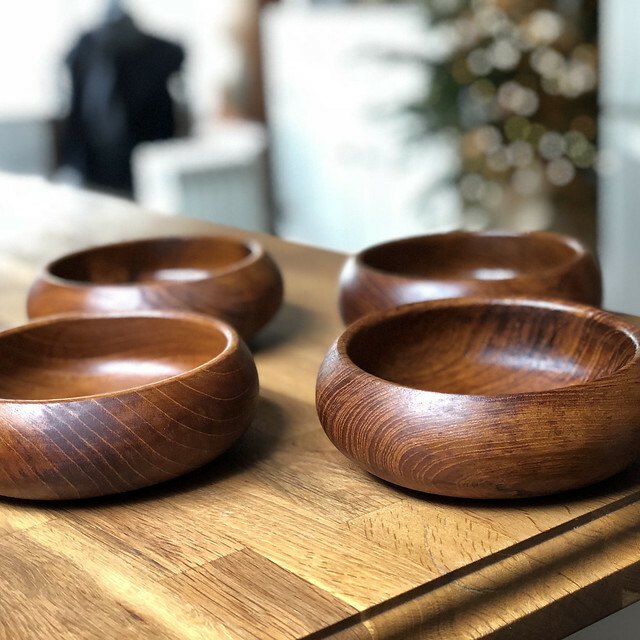 Wendy, as the fan of all things free, classic, and old that she is, wanted to give these worn bowls a good home. They were dry, scratched, gouged in a few places, and clearly a little worse for the wear. But this was primarily on the exterior, while the interior of the bowls looked pretty good. 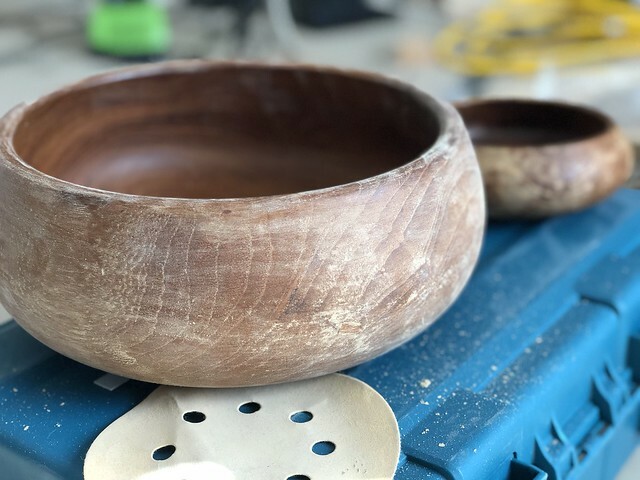 Knowing that wood has the ability to rebound even when much further gone than these bowls, I decided to give wooden bowl rehab a shot. Let me just tell you, I had no real expectations for the outcome, and figured a little improvement would be very much appreciated, but I'm pretty blown away by the end results. Let's quickly go over the effort. I started by sanding the exterior of the large bowl with 220 grit paper. I used my random orbit sander on a slow setting to take out as many of the major blemishes and marks as possible on the larger bowl. 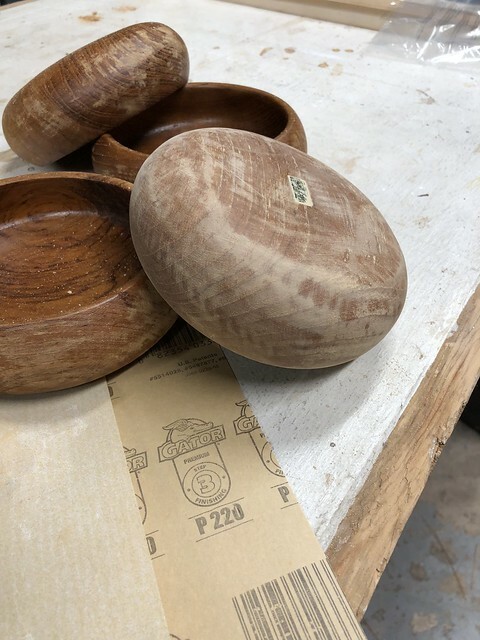 For the smaller bowls I just went ahead and hand sanded using the same 220 grit paper to give us a nice and smooth surface free of the rough patches that had covered the prior surface. 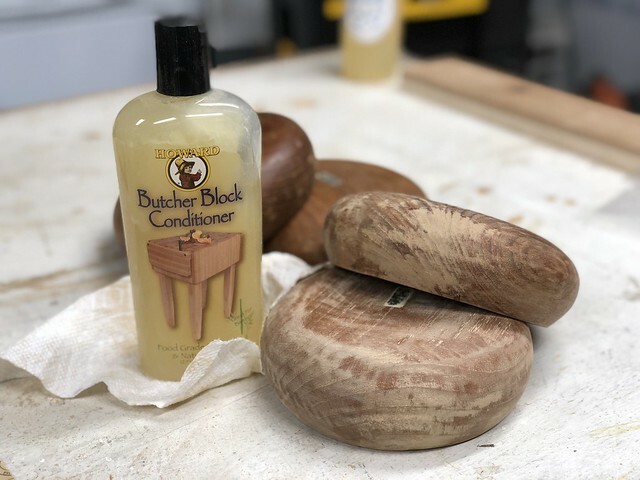 After wiping away the dust from the surface of of the bowl with a small cloth, I grabbed our favorite Howard Butcher Block Conditioner . It's a combination of mineral oil and beeswax and does an amazing job of rehydrating dry and thirsty wood. 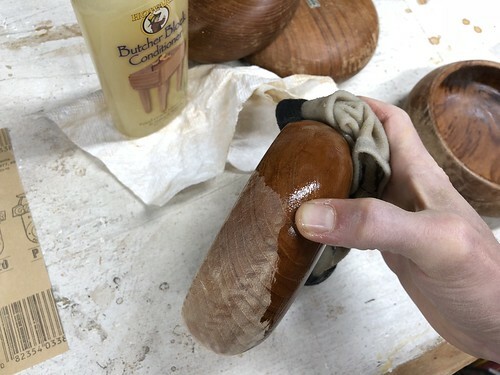 The mineral oil works into the pores while the beeswax works to provide a sort of natural filler. We've used it for years on our butcher block counters, and have loved how it works. A little goes a long way, and we have an application rag we keep that's already saturated, so application is quick and easy. 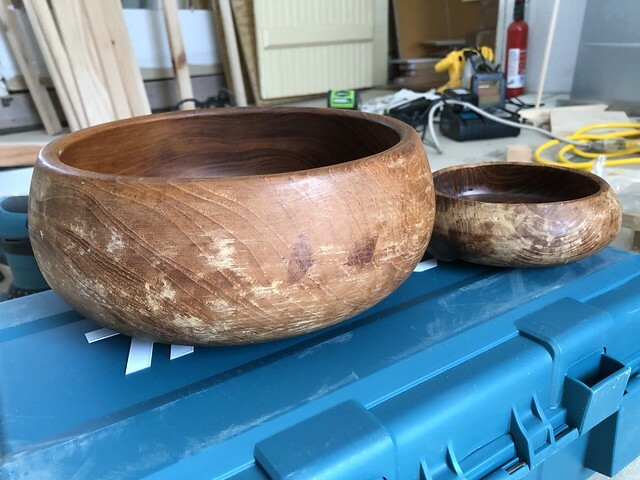 Just look at this jaw dropping side by side of the original bowl, sanded bowl, and bowl with oil/wax applied. It's amazing what this natural and food safe rejuvenating product can do for dry wood. After application I just let the oil and wax sit for several hours to soak into the bowl and slowly dry. Once it's had a good couple of hours to really saturate the wood, come back with a dry cloth and wipe away excess while also buffing the remaining wax into the pores of the wood. 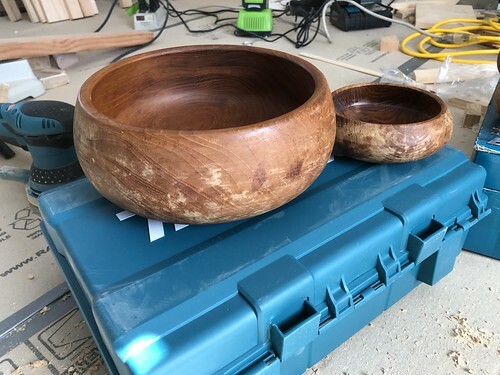 When we were done the end result is a beautiful and rich set of wooden bowls that were not only brought back from the brink, but will also be enjoyed for many more years to come. 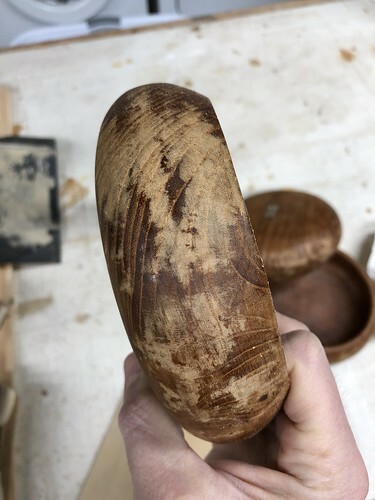 Just look at how warm and wonderful this looks after the oil has been allowed to breathe new life into the large serving bowl. Makes me want to turn on some Disco! 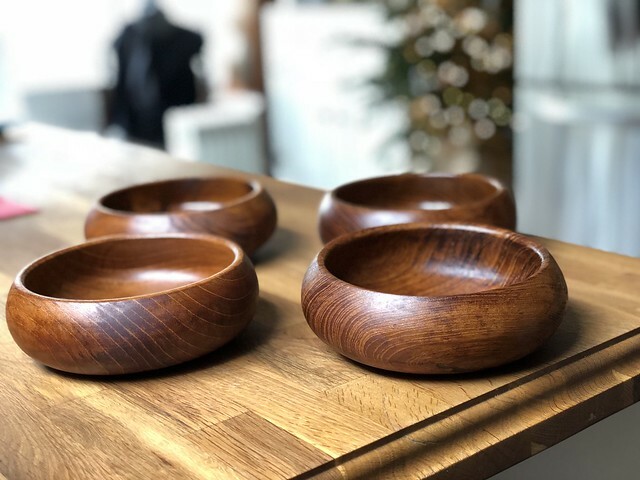 While these bowls may have had their first go-round in the 1960s and '70s, the warm tones and retro style will once again serve us for years to come. And it's also a good reminder that a little bit of maintenance can go a long way when it comes to reviving an unexpected treasure. So if you're going to be home this weekend and into next week, or even if you find yourself picking through an antique shop, just remember to look beyond the distressed nature of what you might find, because everything that's old can often be new again. We hope you have a wonderful holiday weekend of family, food, fun, and treasure hunting! I'm looking for bowls like this to turn into yarn bowls! 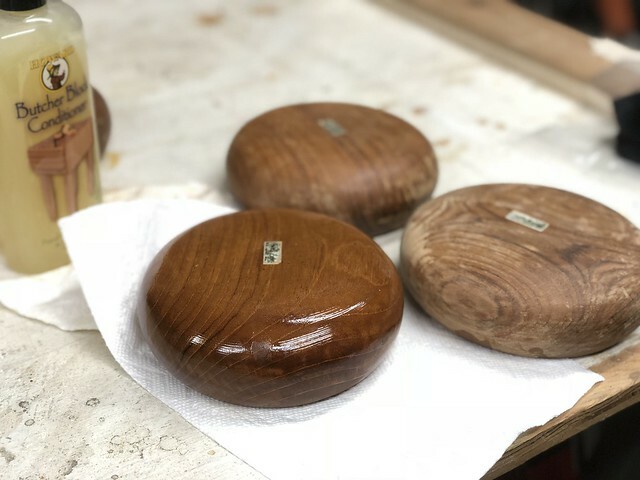 It's amazing how forgiving wood is! It's one of the reasons I love it so much. Thanks for this post. I have an old set from B.Altman that I cherish. 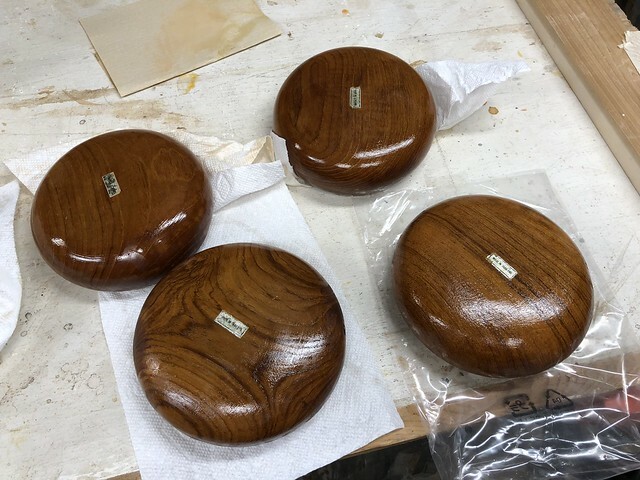 They're rosewood but could use some conditioning. Good revival, what a way to bring back the luster. My Mom had a 12=piece set, plates, large salad bowl, and individual bowls. She always used it during her bbq parties, which meant I had to hand wash all the wooden items. It is still a beautiful set, my sister now has it cause I didn't want to wash them anymore!! Nice save there. That wood conditioner looks amazing. 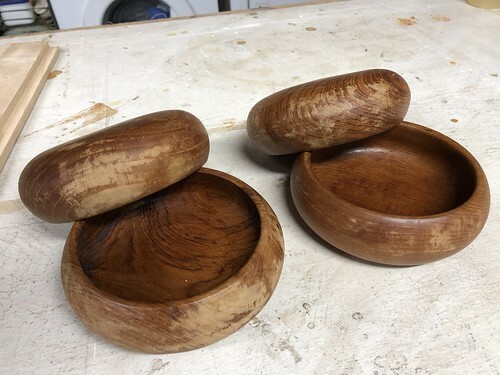 I have a wooden salad set I bought in the early '80s (wood stuff was big then, too, as I recall). Will need to check out that wood conditioner! 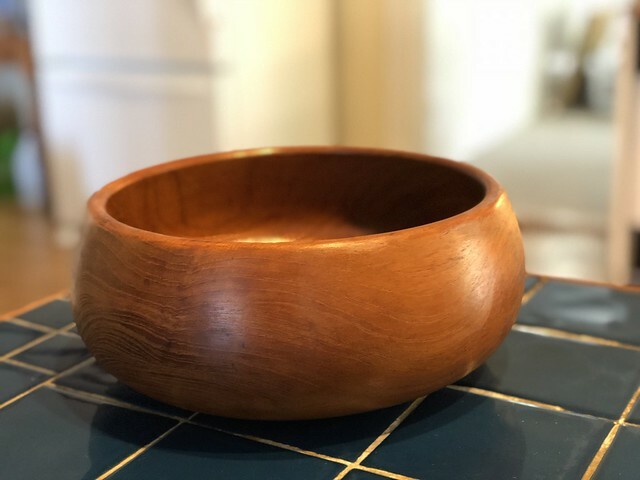 Whitney, check thrift stores for random wood bowls. That's where I got the ones I've turned into yarn bowls.